My name is Vyshnavi Anandan and I am a freshman (class of 2019) intending to major in Molecular and Cellular Biology. I’ve always found archaeology interesting as it combines art and science, both subjects I am passionate about. I am fascinated by the idea that a simple object can surpass the test of time and accumulate a rich history for itself. I hope to learn more about both the mummy portraits and the people who made them! 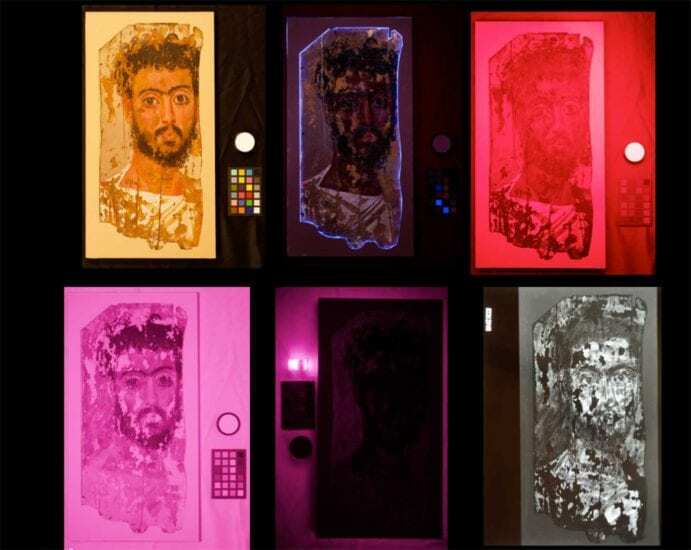 Multispectral Imaging of Portrait of a Man. Images clockwise from top left: Captured in VIS, UVL, UVR, IRR, VIL and X-ray. This week we took a closer look at the surfaces of our portraits and tried to identify substances on them by using multispectral imaging. We were visited by Anna Serotta and Dawn Kriss, both conservators at the Brooklyn Museum of Art. Our guest speakers first introduced us to multispectral imaging: the process of illuminating an object in different wavelengths of light, and then capturing an image of the object in different wavelengths of light in order to determine the presence of certain substances based on how they respond to different conditions. They started by explaining seven different types of imaging. We utilize three specific regions of the electromagnetic spectrum—the visible light, ultraviolet light and infrared sections of the spectrum. We began with visible reflected light imaging (VIS), which records an image in the visible light range when the object is illuminated by visible light—basically a normal photograph. Next came ultraviolet-induced luminescence (UVL), which records in visible light when the object is illuminated by UV light. This method is useful for identifying organic materials on objects, as these substances glow under UV light. Then we discussed ultraviolet reflected (UVR) imaging, which records in UV light while an object is illuminated in UV light. This is useful to identify varnishes or adhesives that may have been added as parts of restoration. We also discussed UVR false color imaging. These are digitally formed by swapping the color channels of a visible light image with the UVR image. Next came infrared-reflected imaging (IRR) and IRR false color imaging. The IRR image is recorded in infrared light while the subject is illuminated in infrared light (such as a basic table lamp with . This method is especially exciting to use on paintings, as some paints look translucent under infrared light, allowing us to see carbon-based underdrawings. The IRR false color image is formed in a similar manner to the UVR false color image; the visible image is digitally combined with the IR image. Finally, we discussed visible-induced infrared luminescence imaging (VIL), where an image is captured in the infrared light range while the object is illuminated by visible light, in our case LED lights. In this method, the pigment Egyptian blue glows very brightly, making it easily identifiable. Then came the fun part: imaging our portrait of a man! We captured one of each type of image and found some really interesting things. In the UVL image, the clavi (the stripe on his garment), nose, lips, eyebrows, and eyes all glowed red. This indicates the presence of the pigment madder lake. Additionally, the whites of his eyes and the area around his neck were bright white. We are still considering what sort of substance could this be, by comparing this image to our x-ray image and looking at the portrait under the microscope. In the UVR image, there dark areas covering the man’s clothing. Since we know that recent restorations were completed in this region, these dark areas may relate to those treatments. In the VIL image, the portrait was completely black. Nothing glowed, indicating that there is no Egyptian blue on the portrait. This is very surprising since Egyptian blue was a popular pigment at the time! We were very surprised, until, after re-imaging the portrait, we could see a sparkly glow of Egyptian blue pigments along the entire gray-green background do the portrait! This was a good reminder to double-check our results, especially when we expect to see something but don’t. MSI Images for the Portrait of the Young Man. Clockwise from upper left: VIS, UVL, UVR, UVFC, X-ray, IRFC, VIL, and IRR . At the end of class, we looked at previously taken images of the portrait of the young man. Using the UVL image, we determined there was madder lake in the clavi of the young man. But the most interesting discovery we made about the portrait of the young man was the presence of a black marking—possibly writing–in the background above the left shoulder. This showed up in the UVL image but not in the VIS image or in the IRR image. What could these letters be? Is it part of the young man’s name? Or was it marked by archaeologists when the portrait was discovered? We will discuss these questions and hopefully identify more substances next week when we spend more time looking closely at all of the images and evidence together. Great article! I especially liked how we have been able to look at these images more in depth. I wonder if we will be able to look at the letters on the young man more closely through further tests! I think we might try looking at them under the microscope some more to see what we can find. Serrota and Kriss were especially helpful in guiding us in yet another avenue of our research. The multispectral imaging added a whole new dimension to our research. 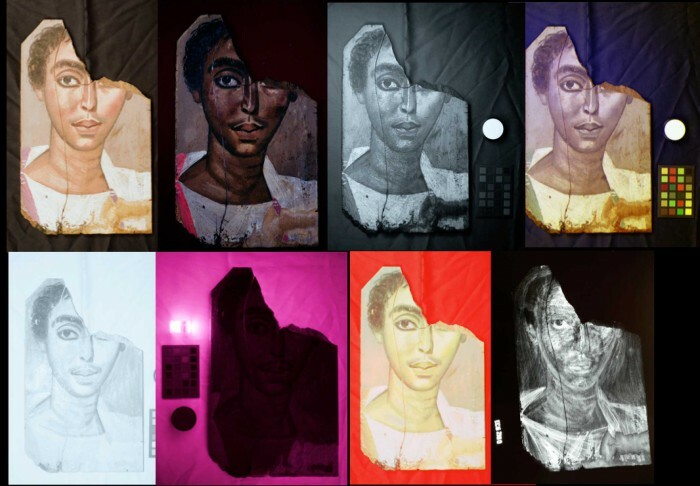 It allowed us to see under-drawings, determine pigments that were used in different areas, and even see markings that could not have been see on the original portrait itself. I was especially fascinated by the under-drawings because they allow us to obtain a better understand of the process involved in the creation of the mummy portraits. Good article Vyshnavi! It was very interesting to know for sure that certain colors were being used by these artists such as madder lake. Modern technology is really remarkable that we can see these different pigments due to their different wave lengths even if they are mixed together. Also I have a quick addition: our original picture of a man under visible induced infrared luminescence imaging (VIL) did not contain any Egyptian blue but a second VIL picture was taken and in this picture Egyptian blue was found in the background and it is the picture seen above. It was so interesting going back and re-image the portraits to try and find some Egyptian Blue, after the first go round with Anna Serotta and Dawn Kriss. It just goes to show how uncertain archaeology as a study can be sometimes. This technology is so new too that it makes me think there are more techniques to come that could tell us even more! I was so fascinated by how madder lake appears in the UVL image. Who would have thought that the “Portrait of a Man” had madder lake on his nose, when it doesn’t appear to by the naked eye! Great article Vyshnavi! I think that it is so amazing how we are able to identify different pigments using different light sources. For example on the portrait of the young man we discovered an underdrawing that we never would have seen with normal light. All of the pictures we took are interesting because each one provides its own unique interpretation of the same portrait. With that being said, I think that the Reflectance Transformation Imaging we will conduct in future classes will only further develop our understanding of the surfaces of the portraits. What really gets me out of the various photographs we were able to take of our portraits are the slight layers of Egyptian blue that we can see on both portraits, particularly in the background of “Portrait of a Man” and on the clavi and left shoulder of “Portrait of a Young Man”. I definitely wasn’t able to see it with the naked eye, but these various MSIs have provided us a new realm of perspectives to take when viewing our mummy portraits. Nice blog Vyshnavi! I expected to see traces of varnish or coating in the UVR image since the Portrait of the Man has had intensive treatment. But surprisingly there wasn’t much evidence of conservation from my point of view. After the discovery of Egyptian blue in the Portrait of the Man, we were even more excited to find some Egyptian blue pigments on the portrait in the area that the VIL image indicated. I’m looking forward to finding more stuffs! I wonder whether it is still possible for us to identify the actual composition of all the pigments applied in these portraits. We know that the multispectral imaging results don’t necessarily represent a given pigment since the reaction could be from a part of the composition of another one.